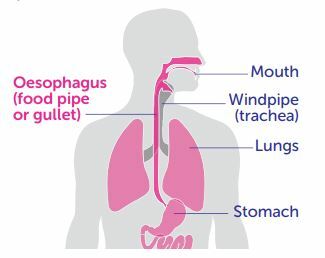 The oesophagus is commonly known as the food pipe or gullet. There are over 8,300 cases of oesophageal cancer diagnosed in the UK each year. More than 8 out of 10 oesophageal cancers are diagnosed in people aged 60 and over. Oesophageal cancer is more than twice as common in men than in women in the UK. Around 9 in 10 cases could be prevented through lifestyle changes. how to reduce the risk of oesophageal cancer. It is part of the digestive system. Is is the tube that carries food and liquids from your mouth to your stomach. It is a good idea to get to know what’s normal for you, so that it’s easier to spot any changes that are unusual or don’t go away. Other warning signs might be blood in your vomit or repeated nausea or vomiting. Some of these symptoms are very common and are more likely to be caused by things other than cancer. But it is important to see your doctor if you notice any of these changes. Around 9 in 10 cases of oesophageal cancer can be prevented through lifestyle changes. Smoking increases your chance of developing oesophageal cancer. Chewing tobacco or betel nut (areca nut, sometimes in paan or gutkha) can also increase the risk. The sooner you quit the better. If you regularly drink alcohol, it’s worth cutting down. The less you drink, the lower your risk of developing cancer. People who smoke and drink alcohol increase their risk of oesophageal cancer even further. Carrying excess weight can increase your risk of developing oesophageal cancer. Try to maintain a healthy weight by being active and eating healthily. Eating plenty of fruit and vegetables may help to reduce the risk of oesophageal cancer. Aim for at least 5 portions every day. Choosing a variety of different coloured fruit and vegetables will help you get a broad range of vitamins and minerals. What else affects your risk? Age: like most cancers, the risk of oesophageal cancer increases with age. Chronic heartburn or acid reflux: acid reflux (when stomach acid flows up the oesophagus) can cause pain known as heartburn. This can damage the lining of the oesophagus and increase the risk of cancer if it happens often for a long time. And it can cause a condition called Barrett’s oesophagus which also increases cancer risk. Heartburn and acid reflux aren’t usually serious but if you suffer from either, especially if it keeps happening, it is important to see your doctor. Personal or family history: your risk of oesophageal cancer may be higher if a parent has had it. Or if you have had some types of cancer before. 4. Have some fruit with your breakfast to tick off one of your 5-a-day before you know it.